I’ve long suspected that musicians were profiting from the so-called secondary concert ticket market. How else to explain the availability of premium seats on Ticketmaster’s TicketExchange site literally seconds after they go on sale? The site is advertised as a “fan-to-fan” source for the best ducats, which is a joke. These people are speculators , not fans. Selling premium-priced tickets on TicketExchange, priced and presented as resales by fans, is a practice used by many other top performers, according to people in the industry. Joseph Freeman, Ticketmaster’s senior vice president for legal affairs, says that the company’s “Marketplace” pages only rarely list tickets offered by fans. The vast majority of tickets are sold by the artists and their promoters with the cooperation of Ticketmaster. The ticket listings are offered in small batches, each at a price, such as $1,164.01, that mimics prices set via online auctions. After inquiries from The Wall Street Journal, the “tickets posted by fans” message was removed from the TicketExchange Web site. Prices also fell, narrowing the gap between Ticketmaster and TicketExchange Marketplace. Spokesmen for Bon Jovi and Ms. Dion had no comment. A spokesman for Van Halen said that the band could not be reached. A booking agent for Messrs. Joel and John did not respond to requests for comment. For years, groupies tried to screw rock stars. Now the rock stars are screwing the fans. My recent Local Rhythms post on the legal action taken against Vail’s 8150 club has generated a surprising amount of feedback. Most responses side with the artists, and many of them are factually false. It’s a very interesting discussion, and after stripping the lies away (the bands aren’t getting sued, the club is; Zeppelin members are signed as plaintiffs, so their names aren’t being used by the Vail Daily simply to get attention for a sympathetic scofflaw), many good points are made. I should point out some facts left out of my article. There are two types of cover bands. One inserts a favorite song into a set of originals, or more to the point, learns how to shape originals by playing a variety of music from artists they enjoy. Sometimes this is an icebreaker for groups who have their own material but are too self-conscious to play it for a strange audience. I’m in a band. A cover band. And in my home town of Ottawa, Canada, 90% of bands are cover bands. I can only imagine what it’s like for the rest of the world. If the nightclub recorded the bands and made money with the recordings, that’s a different story. It’s copyright infringement since it lessens the commercial value of the original songs — by stealing money away from the creator. But if it’s not, this falls under “fair use” of the copyright law. And I would even add that, the money the club owner makes is not from covers being played (which probably is the argument, here), since they are providing services, atmosphere, location, etc. They are paying the bands to perform. Bands should be the ones held liable, not the club owners. And even then, I believe they shouldn’t. Do bookstores pay licenses for people coming into their stores only to sit down at the coffee shop and read books for free? I mean, they provide the location, amenities, and even a good crowd. Or what about a book review in a magazine read in said bookstores? What about music playing over the sound system playing at the music while they’re reading? I’m not a intellectual property lawyer by any stretch, but as a writer myself, I know enough of the law to know this to be true in most cases. This is going to turn out like the whole Metallica/Napster fiasco. And as we know, this didn’t stop anything. Admittedly, this situation is different. Or is it? Labels attempt to intimidate their fans. In this case, clubs, bars and restaurants who hire cover bands will suffer the brunt of a decline in clientele when they are forced to hire original acts — unknown, or expensive (if popular), original acts. The nightclub owner is not the ones who suffers. Again, it’s the fans. And it’s a tragedy. Nevertheless, this is setting a dangerous precedent and bands will be facing a monumental task if they were to clamp down on every club with cover bands. And it’s not great marketing, either. You hear a song from a cover band at a club, you’ll be tempted to buy the original — or the album where licenses ARE paid to the original creators/labels. On the other hand, there are bands like Lez Zeppelin, Hell’s Belles and Rain that ape famous bands like Led Zep, AC/DC and the Beatles – and make a lot of money in the process. Those are the groups ASCAP should be going after. Because I write about a local music scene with many aspiring bands who have day jobs, and club owners who are sympathetic to them, I tend to side with the underdog. ASCAP isn’t a saintly organization, fearlessly representing defenseless artists. How many performers even own the publishing rights to their songs? The stories of ASCAP’s predatory practices are legion on my beat. Radio’s ability to break new music has faded; fewer stations even play music anymore. Those fields are fallow, so ASCAP has ramped up nightclub enforcement. When I worked in radio, we lived in dread of receiving the ASCAP diary. Station management went so far as to try and ban their songs whenever possible during the recording period. But they always got their money, because the law was on their side. Now it’s bars and restaurants on the receiving end of this treatment. If it causes nascent musicians to put down their axes before they even begin, that’s a bad thing. Vail, Colorado – I know, that’s a strange dateline for a local music column. However, recent news from the Rocky Mountain State is hitting close to home. In yet another example of a music business utterly bereft of new ideas, the members of Led Zeppelin and Van Halen are suing the owner of Vail’s 8150 nightclub for hiring bands that play cover versions of their material. They’re looking for more than $30,000 per song in damages. Publishing organizations like ASCAP and BMI earn their money enforcing copyrights. That’s not necessarily a bad thing, but this is ridiculous. Worse than that, it’s counterproductive – at least where the musicians are concerned. There’s a story of Paul McCartney seeing Jimi Hendrix play a teeth-rattling version of “Sgt. Pepper’s Lonely Hearts Club Band” in a London club, two days after that album was released. I doubt Sir Paul was thinking about a performance fee that night. 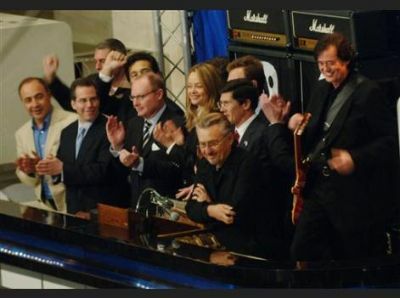 Yet here are Jimmy Page and Robert Plant doing just that. These are the same guys who tried to rip off Howlin’ Wolf on their second album, by renaming his “Killing Floor” as “The Lemon Song” and trying to pass it off as an original. They were sued, and lost. Can’t they make nice long enough to complete a cash-grabbing tour like the Police? It makes absolutely no sense to risk losing their biggest fans (you know, the ones so dedicated they learn all of your songs, note for note). But the reasons for this are sadly obvious. Neither band has made an even semi-interesting piece of new music in over 25 years. Like everyone else in the industry, they’re reduced to repackaging old work to milk past glory. It’s no longer music; it’s an annuity plan. They should follow Eric Clapton’s cue; grateful for the success that “Cocaine” and “After Midnight” brought him, he made a record with J.J. Cale last year – a class act. Who’s making music this weekend? Thursday: The Wailin’ Jennys, St. Anselm College – A more rustic Dixie Chicks, this band has won several awards in their native Canada. Sweet three-part harmonies lift their bright, natural sound, which begs a question. Why does so much great Americana music come from north of the border? The Lovell Sisters, winners of a recent “Prairie Home Companion” talent search, open the show. Friday: Have Blues Will Travel, Salt Hill 2 – Last week I talked about plans for Irish music on St. Patrick’s Day eve. Now comes word of music every Friday and Saturday in Newport’s newest restaurant. Tonight, it’s a well-regarded duo playing traditional, harp-sweetened blues. Tomorrow brings R&B, with Mike Benoit and Jimmy Ruffing. In the coming weeks the Eagle Block eatery welcomes stripped down pop (Rich Thomas & Wally Wysk 3/10) , bluegrass (Spare Change 3/24) and, obviously, Irish sounds. Great news! Saturday: Chris Whitley Memorial Celebration, Boccelli’s – The hard-living Whitley left us in 2005, but his music continues to inspire. Jeff Lang, who recorded with Chris on “Dislocation Blues,” due for release this month on Rounder, headlines the show. Dan Whitley played an incendiary set at last year’s Roots on the River festival; once again he’s back for this, the second annual tribute to his late brother. Josh Maiocco hosts, Melissa Sheehan also performs. Sunday: Fogey Mountain Boys, Canoe Club – Authentic bluegrass from a group of locals who love to play it. Since we’re on the subject of royalty fees, I wonder if Woody Guthrie lurked around campfires waiting for someone to play “This Land Is Your Land”? It’s doubtful, and these days all his stuff’s in the public domain. Since it’s Sunday, the Boys play for 3 hours. Sit close if you want to really enjoy the music. Monday: Gaelic Storm, Iron Horse – This wonderful Irish quintet starts March in style with a long run through the region. They were in New London Tuesday, and play the Capitol in Concord tonight and Randolph’s Chandler Music Hall tomorrow. They have a neo-traditional sound that fits everywhere from the Dublin (Ohio) Irish Festival to the House of Blues (where they recorded a recent live DVD). Tuesday: Open Mike with Josh Maiocco, PK’s Public House – Josh took the reins from Ezra Veitch last year for this Bellows Falls tradition, and he’s holding things down nicely. Anyone who wants to play can step up to the microphone and join in, but you should be aware that your friends and neighbors may be listening at home on WOOL-FM, which broadcasts everything live.